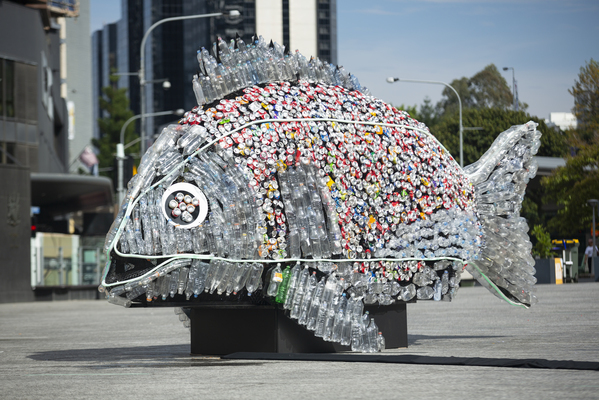 Mackay artist and conservationist David Day designed this giant fish sculpture with 4000 recycled drink containers to launch the recycling scheme. Queenslanders can now turn trash into cash with the state’s new container refund scheme, offering 10 cents back for each eligible container returned for recycling. The new scheme Containers for Change launched on Thursday 1 November to reduce litter from almost three billion drink containers, which are sold in Queensland yearly. To mark the launch, Mackay artist and conservationist David Day designed a giant sculpture made entirely from 4000 recycled drink containers, standing 3.8 metres high and displayed in Brisbane’s King George Square. The organisation tasked with establishing and running the scheme is Container Exchange (COEX). COEX acting chair Alby Taylor said action was needed as statistics show Queensland has one of the highest littering rates in the country. “Just one year’s worth of container litter would go around the world roughly ten times if laid end-to-end,” Mr Taylor said. The network launched with more than 230 refund points throughout the state, with that number expected to grow to more than 300. “The scheme also provides a great opportunity for businesses to set up container refund points,” Mr Taylor said. According to Mr Taylor, as more mobile and fixed collection points come on board, access to refunds will gradually improve. Ken Noye, chief executive officer of COEX, said a statewide open tender process for container refund points received a great response, however, some rural and remote areas of Queensland and the Torres Strait do not yet have operators. “COEX staff have been travelling to those areas to work with local councils and businesses to develop sustainable solutions,” Mr Noye said. These can take the form of mobile or pop-up container refund points, such as trailers or utes with cages on the back, installed in towns which have so far missed out on container refund points. The state government has recognised the problem and will provide a $10,000 grant for not-for-profit organisations to set up donation points in rural and remote communities. In addition, Aboriginal and Torres Strait Islande councils can apply for grants of up to $50,000 to take part in the scheme. “Ultimately, the Queensland environment will benefit from a reduction of pollution in our oceans, rivers and creeks,” said Mr Noye. To take part, return your drink container to a refund point to get your 10 cent refund per container. Or you can simply donate them to a community group. For more information or to register, visit www.containersforchange.com.au.Information about grants can be found at www.qld.gov.au/environment/pollution/management/waste/recovery/funding-grants. Containers for Change is focused on reducing litter in the environment so recycling efforts are on drinks generally consumed away from home (soft drinks, water bottles, small flavoured milk). This includes most glass, plastic, aluminium, steel and paper-based cartons between 150 mIllilitres and three litres. ■ Drink containers generally consumed only at home (wine bottles, spirit bottles) are excluded. This includes plain milk, pure juice drinks and cordials.